Bosses at some of Britain’s biggest firms face a shareholder outcry for topping up their salaries through pension payments. The likes of Lloyds and Burberry are in the firing line for paying their chief executives hundreds of thousands of pounds each year in retirement contributions. The payments are done through special schemes not open to ordinary staff, who must settle for a much lower rate of support than the top brass. And instead of having to lock their savings away for years in a retirement scheme, bosses just get given a lump cash sum on top of their annual salary. The Investment Association – which represents big City shareholders – is targeting the practice and has already written to the worst culprits, urging them to treat senior management in the same way as shop floor workers. Huge pension payments are likely to come under heavy scrutiny in this year’s round of annual general meetings, and could lead to investor rebellions at some of the UK’s biggest names. In the letter to some of the largest listed firms, the IA’s corporate governance chief Andrew Ninian said: ‘Pension contribution rates should be aligned with those available to the workforce. Sacha Sadan, head of corporate governance at £1 trillion fund firm Legal & General Investment Management, said that from next year they will start to vote against sky-high pension payments. 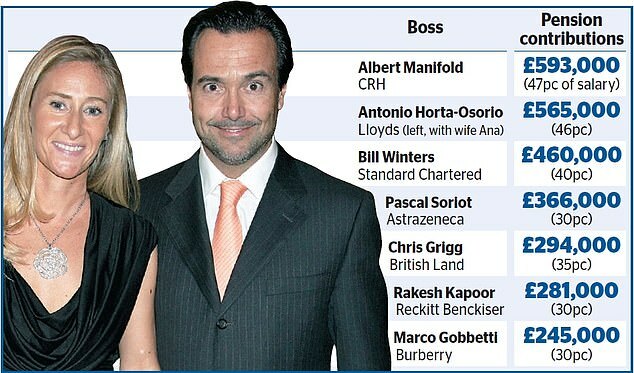 Among the worst culprits is Lloyds, where chief executive Antonio Horta-Osorio gets a pension contribution of £565,000, equal to 46 per cent of his £1.2million annual salary. In total, he earned £6.4million in 2017 when pension contributions, base pay, bonuses and benefits were all taken into account. By contrast, staff in the company-wide pension scheme get contributions equal to 13 per cent of their annual wage at most – and this is handed out only if they personally put in 5 per cent. As is normal in a defined contribution scheme, this money is all invested into the market and locked away until the employee retires. Lloyds used to have a more lucrative scheme but this is now closed. Horta-Osorio and the other bosses, however, get their pension contributions as a lump cash sum each year. Critics said because of this the payments are more like a hidden salary top-up rather than a true pension scheme. Labour MP Wes Streeting, a member of the Treasury select committee, said: ‘It does rather look like one rule for the top and another rule for the rest. Other FTSE 100 bosses who get ultra-lucrative payouts include Albert Manifold, of building firm CRH. He received £593,000, or 47 per cent of his annual salary. Bill Winters, head of Standard Chartered Bank, got £460,000 or 40 per cent, and Rakesh Kapoor, the former head of consumer goods titan Reckitt Benckiser, got £281,000, or 30 per cent. Reckitt’s staff scheme, meanwhile, pays a maximum of 10 per cent. Marco Gobbetti, chief executive of Burberry, was handed £245,000 or 30 per cent. The luxury fashion brand is notorious for also giving senior executives a generous cash allowance to spend on whatever they like. In Gobbetti’s case this was £60,000 in 2017/18, part of a total payout of £6.3million. Labour MP John Mann, another Treasury committee member, said: ‘These huge pension payments are shameful and suggest that bosses are topping up their already massive salaries through the back door.